Folder Gluer Packing Systems, Prefeeds and more. IMPACK PACKAGING specializes in the analysis of work methods and the design and manufacturing of equipment for manufacturers of folding carton, micro-fluted and corrugated packaging. PPCTS & IMPACK PACKAGING offer innovative solutions in the area of ergonomics, productivity and workplace health and safety, with a range of products tailored and adapted to today’s folding carton folder gluer packing manufacturing needs. Click on the links below for more details and see our videos at the bottom of the page below. 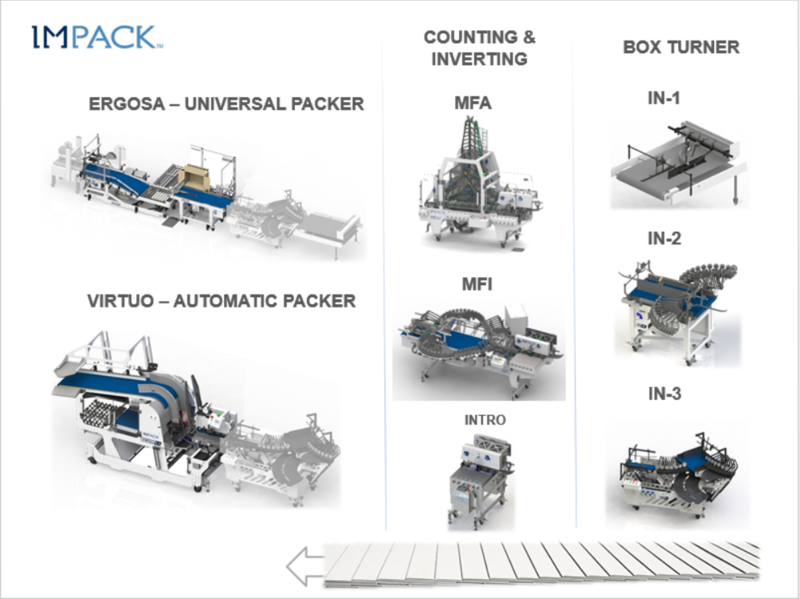 IMPACK PACKAGING, founded in 2001, designs and manufactures a wide range of innovative, productive, cost effective and ergonomic packing solutions for today’s folding carton and micro flute folder gluer manufacturing needs. Initially challenged by local Canadian folding carton manufacturers to reduce work related injuries suffered by folder gluer packing personnel, IMPACK successfully answered that challenge by designing and manufacturing equipment solutions that in addition to address workplace health and safety issues, also provides increased productivity and throughput. IMPACK offers standard packing systems for typical folder gluer operations from short to long run and low to high speed applications, as well as specifically customized solutions to handle unconventional applications and productions. The ERGOSA UNIVERSAL™ folder gluer packer was developed to reduce unnecessary movements made by packing personnel, increase ergonomics and organizes the packing method in a more fluid motion that greatly improves the packing personnel’s efficiency. The ERGOSA UNIVERSAL™ packing method removes stress from the packing personnel’s joints, tendons and wrist, as the cartons are slid into the case without any lifting, resulting in less injuries and greater packing efficiency. The PERPACK™ and MAE™ attachments when attached to the ERGOSA UNIVERSAL™ packer, allows for easy packing of medium to larger 4 and 6 corner cartons when the traditional ERGOSA™ sliding method is less suitable, some pre-alternated lock bottom cartons, as well as very small straight line boxes. The exit end of the ERGOSA can also be equipped with four flap case flap closing devices, as well as case marking systems. The VIRTUO AUTOPACKER™ is a single row, single level automatic packer for folding cartons, micro fluted cartons and some corrugated boxes. The VIRTUO™ automatic folder gluer packer can pack straight line, 4 & 6 corners, as well as pre-alternated lock bottom cartons. The straight through packing approach of the VIRTUO™, with a fix feeding, counting and separation section, combined with a vertical corrugated case descent, allows for high performance packing of small to very large boxes. The VIRTUO™ can handle, recovered open top lock bottom corrugated cases, corrugated cases with or without top flaps and the bottom flaps do not require taping prior to packing. The case feeding of empty corrugated cases into the VIRTUO™ is done automatically from the top and the filled cases are ejected automatically from the back of the packer, in straight line with the gluer, to a taping device or conveying system. IMPACK also specialises in preconditioning systems to prepare the carton or box shingles exiting the folder gluer for packing. IMPACK offers various shingle turning, as well as batch alternating devices. In addition to the existing IN 1.6 and IN 2.0 turning system, IMPACK as now introduced the new patented IN 3.0 CARTON TURNER which allows turning of carton or box shingles exiting the folder gluer compression section, right or left or flow straight through, and enter into a UNIVERSAL™ packer, VIRTUO™ or packers from other manufacturers, without the need to move the packing system from the centerline of the gluer, reducing start-up and make ready time. The patented MFA™ batch inverting system inverts auto/lock bottom folding carton boxes in preset counted batches for packing into corrugated cases with the UNIVERSAL™ or VIRTUO™ packers or by hand. The MFA™ allows for straight through passage of the carton shingle when batch inverting is not required without the need to remove the unit, to produce other types of cartons. IMPACK’ solutions are modular and can be installed in several possible configurations to meet each customer’s specific needs and situation. With continuous investments in R&D to developed new technologies and equipment, IMPACK is the leading expert in folder gluer packing solutions.